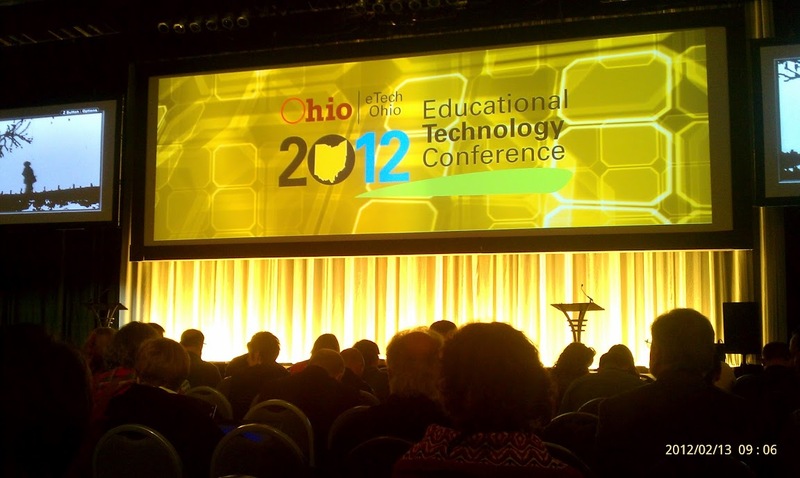 For the first time in recent memory, I didn’t present at the eTech Ohio Educational Technology Conference this year. Last summer, I decided to take a year off from conference presentations, and instead focus on some of the big questions surrounding the future of education. In the intervening months, I have done a lot of reading, participated in several online networks, and had countless conversations with smart people about public education. It’s clear to me that our test-driven, standards-based, knowledge-transfer approach is not meeting our students’ needs anymore, and we are struggling as public schools to remain relevant. It was through this lens that I approached the conference this year. I’m looking for ways in which schools are reinventing themselves. While technology plays a role in that change, it cannot be the driver of it. Maybe I’ve been in this job too long. For the last 13 years, I’ve purchased computers, upgraded networks, replaced servers, and improved our technology infrastructure. I’ve fought for funding to replace computers, only to fight again to replace them again six years later. I’ve been responsible for both the purchase and the disposal of hundreds of thousands of dollars’ worth of technology. And while we’ve seen progress in our use of technology in the schools, we haven’t had the transformational change that we need. So I stayed away from the gadgets. I don’t go in the exhibit hall. I don’t meet with vendors. I’m not interested in buying your amazing solution that’s looking for a problem to solve. For the most part, I also stayed away from the gadget-focused breakout sessions. Instead, I tried to focus on sessions that showcased bold initiatives for changing how teaching and learning is done in our schools. The keynotes didn’t help much. On Monday, Dr. Michio Kaku managed to win over a skeptical audience by personally taking credit on behalf of the physics profession for every major technological advance of the last 50 years. He then boldly predicted that technology is going to become more powerful, smaller, and less expensive in the years to come. He referred to wearable technology, like computer chips embedded in contact lenses. He described augmented reality, where a computer gives you real-time information about the things you’re looking at. He talked about hand-held MRI scanners and other amazing medical devices. But he failed to connect these technologies to education. While he advocated for more teaching about technology, he didn’t really address how these new advances are going to revolutionize teaching and learning, or what we, as educators, can do to prepare for it. Tuesday’s keynote wasn’t much better. In a colossal miscalculation, Sascha Meinrath misjudged his audience. He gave a speech, not a presentation. He read from his stapled manuscript, often pausing mid-sentence to turn the page. He never strayed from the podium, and used no visual aids in his presentation. While the content of his speech was excellent, it was lost in the presentation style. Looking at the Twitter backchannel, for every message about the content of his speech, there were eight messages about the presentation style. Sadly, his points about the struggle between protecting and securing our rights and liberties online were lost on this audience. On Wednesday, it was Brené Brown’s chance to take a shot at an engaging keynote. It wasn’t looking good. For starters, her career has centered around research on vulnerability and shame. But she immediately connected with her audience, and used a unique blend of humor, self-deprecation, and thoughtful insight to tie the ideas of inadequacy, vulnerability, and fear to teaching, learning, and technology. As she talked, she eloquently wove together the themes of embracing failure, continually striving for improvement, and engaging in learning communities. Given her research interests, her presentation was surprisingly inspirational. It left me with some hope that we really are going to figure out this next generation education business. This optimism was echoed in the Leadership 2.0 breakout session led by Eric Sheninger. As a principal in New Jersey, Eric began forming a personal learning network a few years ago. He has embraced social networking tools, and transformed his school. He now leads a school where students take responsibility for their own learning. He affects school culture by including his teachers in the decision-making process and empowering them to set policies that are in the best interests of their learners. He shared many strategies for using social media in academic, professional development, and public relations contexts. This is a stark contrast to the policy discussion held in the technology coordinators’ meeting. Megan Greulich, an attorney for OSBA, shared a number of changes that districts should be making to their policies to reduce liability and comply with state law. Among these changes are the inclusion of cyberbullying prevention language and updates to acceptable use policies to accomodate new e-rate requirements. Many of the attendees expressed frustration that curriculum is being driven through policy, and most seem to be caught between the “low liability” position of attorneys and school boards and the “high useability” needs of teachers and students. It’s difficult to find middle ground that will allow access to needed resources while minimizing the potential for costly litigation. On the technology side, Joe Bires shared some insights on technology evaluations. Looking at school technology from a technical perspective, Bires specializes in evaluating technology initiatives in schools. He recommends gathering data from as many different perspectives as possible, and looking for the underlying reasons behind surface observations. It is important to consider the project in the context of the school culture, and to recommend a plan of action for improvement once conclusions have been drawn. One idea that is finally getting quite a bit of traction is blended learning. A group of teachers from Berea City Schools shared their experience going “paperless” in their classes by using a variety of tools. Essentially, they’re using blended learning resources like Moodle and Google Apps to minimize the amount of printing they’re doing. Our school district has similar goals, and it’s interesting to see that Berea is giving their teachers the flexibility to choose the tools that best fit their needs. David Hamman, a science teacher at Medina High School, shared a similar project. He advocates the use of focus groups and pilot projects to get started with blended learning programs. I thought that I would see a similar program from Michael Pennington and Garth Holman. These two teachers work in very different schools, 30 miles apart. Their students collaborate on a digital wiki-textbook for their class. In this case, the focus isn’t on creating a textbook for future students to use as much as creating a lasting legacy of the students’ experience in the class. Over the last few years, students have revised, expanded, and improved the textbook to the point where it is used as a class text by other schools. But the primary goal is for the students to share what they’ve learned by creating an authentic, useful product. I was impressed by the teachers’ attitudes toward this project, and the sense of ownership they have been able to inspire in their students. Despite my aversion to sessions that focus on the tools, I did attend three presentations that specifically addressed the use of Google Apps in education. As a district that heavily uses Google’s tools, it is always interesting to see the innovative things other schools are doing with the same resources. Senior Google Education Evangelist Jaime Casap was a featured speaker, and his presentation focused on the “why” question more than the “how” question. Why should we be using technology in education? What does technology buy us that can’t be done as easily without it? Casap focused on a need for innovation, adaptability, problem solving, and collaboration. He observed that about 10% of the world’s knowledge is available online, and we are acting like we have the world’s information at our fingertips. Our students are going to need a whole new set of literacies to thrive in a world where 70% of the sum of all human knowledge is freely available online, a milestone we’ll reach within the next generation. While Google’s tools help schools do this, his message focused less on what Google Apps can do, and more on the need to change the focus of education. A group of teachers from Ross Local Schools also shared their use of Google Apps in a breakout session. Their session focused more on the logistics of operating a school than on the actual teaching and learning, but they shared some valuable perspectives on using shared calendars, Google documents, Forms, and Sites to communicate with parents, schedule shared resources like labs and conference rooms, and distribute web site management responsibilities across the school. North Canton’s Eric Curts went into more detail about Forms in his session, illustrating how they can be used for everything from self-grading short cycle assessments to kindergarten registration. One of the areas with which I struggle is that of design. I can create a functional web site. I can evaluate tools and resources and gadgets based on their usefulness, and I can do a cost-benefit analysis. But I’m not so good at creating and evaluating elegance. I have a hard time designing web sites that are intuitive to use and as visually appealing as they are useful. Zach Vander Veen’s session on Principles of Design helped with that. He provided some great ideas for organizing and presenting content in a way that is visually appealing and easy to follow. His focus was on organizing resources for online or blended learning, which fits well with some of our district goals. Alvin Trusty also addressed visual literacy in an entertaining presentation that explained how to create and use images to convey a particular message. Overall, the conference is struggling with the same identity issues that schools are. We have discredited the lecture as the primary and most effective means of teaching, but nearly all of the conference’s sessions perpetuate the model of a speaker standing in front of a group of audience members and talking for 45 minutes. In many sessions, we still focus on the tools, the shiny gadgets that everyone swears are going to make a difference in education. I talked with two of the conference leaders about this, and encouraged them to solicit sessions that are more interactive and participatory. I suggested taking a page from the Educon book, and specifically asking, as part of the proposal form, how the presenter intends to engage the audience in a conversation, rather than just talking for an hour. Hopefully, they’ll encourage presenters to start doing that in future conferences. It was also disheartening to see that the unconference flavor of last year’s conference was gone. Due to the weather, last year’s conference saw many sessions cancelled, and the attendees who were left started creating their own sessions. It was pretty easy to add a topic to the agenda, find an open room, and hold an impromptu session. This year, I wasn’t aware of any of these spontaneous sessions. While I still consider the conference to be time well spent, I think, like public schools, it’s time for eTech to rethink the purpose for the conference and work to meet the attendees’ changing needs. My superintendent was looking for an event to attend. He keeps hearing about iPads and 21st Century Skills and digital textbooks and iPads and 1:1 programs and social media and iPads and YouTube and Facebook and Twitter and iPads and he needed some context. He wanted some way to make sense of it all. I suggested the 21st Century Skills Summit earlier this month in Columbus. This one day event was sponsored by the Ohio Department of Education, eTech Ohio, Ashland University, the Partnership for 21st Century Skills, and several other respected organizations and agencies. I thought the day would provide some great perspectives on the real needs of our students, and the challenges schools face in meeting these needs. I was right. Karl Fisch started things off with an outstanding keynote focusing on personal learning networks. As we make connections and build our own personal learning networks online, we interact with other professionals and learn from one another. He described the impact of the Did You Know video on his own professional life, and focused on authentic work for students instead of simply preparing them to take high stakes tests on largely irrelevant content. The thing that I love about Karl is that he’s a very unassuming guy. He’s one of us. He’s just a math teacher – turned technology director – doing everything he can to help his students. He might speak in front of crowds of thousands and have millions of views of his videos, but he’s just another guy struggling with the same issues we’re all facing. Author Dan Pink joined us via Skype. He talked about his books, A Whole New Mind and Drive, and drew connections between his work and the education world. For me, the most poignant moment came when he talked about merit pay. Motivation isn’t the problem with education, he observed. “Teachers are the most motivated group of people I’ve ever seen.” These are the people who are up late planning instruction and grading papers. Teachers are the ones using their own resources to buy classroom supplies. Teachers, in general, care about their students and will do anything they can to help them. But IF motivation were a problem, merit pay wouldn’t fix it. Financial rewards help improve productivity and quality of work in menial tasks. If your job is assembling instrument clusters for cars, or emptying trash bins in a shopping mall, or shelving library books, then merit pay will make you more efficient. But for jobs requiring critical thinking, complex decision making, and creativity, merit pay doesn’t improve motivation. In the afternoon, Ewan McIntosh provided an entertaining description of his work in the area of problem solving. He contends that problem solving is not as critical as everyone seems to make it. Solving the problem is the easy part. The difficult piece is identifying the problem to be solved. That is, how do you look at a situation, identify the problem that is causing the less-than-ideal conditions, and then describe how solving that problem can alleviate the condition? Once the problem is defined, finding a solution is the easy part. He explained that having students doing project based learning where they’re simply solving contrived, hypothetical, over-simplified problems does not really help students develop their critical thinking skills. Usually, in these types of events, the educational establishment takes quite a beating. Standardized testing and No Child Left Behind are easy targets, as we have transformed our educational system over the last decade to become a race to mediocrity. We devote nearly all of our resources to ensuring that all students meet a basic level of competency, and then stop focusing on them once they’ve passed the test. But in this case, most of the stakeholders were in the room. The state Superintendent for Public instruction kicked off the day with a refreshing perspective on 21st century education focusing on critical thinking, creativity, communication skills, and collaboration. At our table, my superintendent and I were joined by four Ohio Department of Education employees. Their job is to implement Race to the Top. But rather than being defensive about the program, we had several honest discussions of the challenges and success stories surrounding our schools’ adoption of these new literacies. We also had a state board of education member sitting at our table, and his experience as an elementary and secondary teacher, teachers’ association president, school administrator, and school district board member gives him a unique perspective of education from nearly every angle. He, too, seemed frustrated with the status quo and excited and hopeful about the future. Interestingly, there was one state agency that wasn’t involved in this event. Back in February, Ohio’s new Governor, John Kasich, named Robert Sommers as the Director of the Governor’s Office of 21st Century Education. There’s not really much information online about this new office. As far as I can tell, they have no web presence, no list of staff members or initiatives or even goals. And they’re separate from the Ohio Department of Education. It sounds like the governor wanted to create a distinct entity completely separate from the current structure to take an objective view of 21st century learning, and then influence policy and budgeting with recommendations for improving education for Ohio’s children. On the surface, one would expect that this office would have a vital role in this 21st Century Skills Summit. Whole group classroom instruction — a teacher addressing an entire class — will be rare if nonexistent. Adult success will be judged in terms of student success. The use of technology and improved management will make education much more cost effective. We’ll set aside the “rare if nonexistent” comment, because either I’m not smart enough to understand what he’s talking about, or he doesn’t know what those words mean. Evidently, a 21st century school is one that uses technology to automate the process of education, getting children to pass the tests of minimum standards less expensively. There’s no mention of collaboration or creativity or communication skills. There’s no authentic assessment or project-based learning or critical thinking or problem solving (or problem-identifying). This is all about test prep, at the lowest possible cost. By the way, “student success” is a code word for “student test scores.” And “cost effective” means outsourcing to companies who provide bare minimum services and pay their teachers $30,000 per year with no benefits. “Mass customization” means 60 students per class, generally working individually with little or no interaction with their peers or their teachers. Just so we’re clear. So it seems that we have two completely different views of 21st Century Education in Ohio. We’re at the point where the term is essentially meaningless. The two visions are so completely different from one another that we can’t use the term anymore to identify a common ground on which to base discussion. So I’m moving on. I’m not talking about 21st century skills or 21st century learning anymore. The Partnership for 21st Century Skills (proper noun) focuses on next generation learning. Maybe that’s a better way to think about it. We’re not educating for the 21st century. That term was really cool when the 21st century was still a decade away. But the 21st century is going to be half over before we really figure out what we’re talking about. Let’s focus instead on educating the next generation. 21st century skills are dead. Long live next generation learning.